The Bed and Breakfast "Gli Allori" is located in Custonaci, in the province of Trapani. It is in a very strategic position from which you can reach out and get to know all the Trapani area, rich in history, nature and culture. Guests staying at the bed and breakfast will be directed to the discovery of the most beautiful places in Western Sicily. 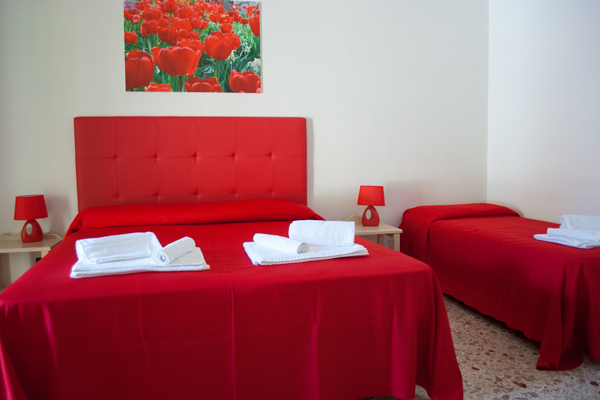 The Bed and Breakfast "Gli Allori" has three comfortable and welcoming bedrooms: two triple and one quadruple. Outside you can find some beach chair where you can relax yourself and make your stay more confortable. Free Wi-Fi on an unlimited number of devices!!! Is located in a hilly area. Its territory is referred to as the "Riviera of the marbles" to the presence of numerous quarries for the extraction of marble. The city offers beautiful places to visit: the Sanctuary of Maria SS. Custonaci, several beams, shrines, several caves: the most fascinating is the cave Mangiapane, ancient prehistoric, where every year during the holiday season relives the Nativity. A few minutes drive from the city center, is located Cornino Bay and the picturesque Mount Hood. Is called "the city of the two seas" because leans on a spit of land surrounded by the sea. It has many places of historical, artistic and landscape, including: churches and convents, palaces, baroque or neoclassical, the Regional Museum "Pepoli", Anthropological Museum in "Tower of Ligny", the Dovecote, the bastion of the Impossible. Is a major seaside resort of mass national and international level. At the center of the village stands a shrine dedicated to San Vito. Every year in September there is the manifestation of the "Cous Cous Fest", an international festival of culture and gastronomy of the Mediterranean. A few kilometers from San Vito Lo Capo is the Zingaro Nature Reserve. Is a paradise of nature for the wide variety of natural environments on its 1,600 acres. The coast opens onto the sea with high limestone walls and jagged, broken by small coves, rocky gorges and caves. A medieval town, is known worldwide for the activities promoted by the Ettore Majorana Centre for Scientific Culture. Historically it was well known for the presence of a temple dedicated to Venus Ericina. From the Mother Church, the city walls of the eighth century. B.C. with the three doors Norman: Sword Gate, Porta del Carmine and Porta Trapani, the Pepoli Castle and Venus Castle, a medieval fortress of the XII-XIII century. Is an archaeological site of great national and especially international. To see, the theater, which dates from the middle of the fourth century. BC, the Temple of 430/420 BC and the Sanctuary resort in Mango. Famous for its tuna has become a seaside resort renowned for its sea and its Faraglioni. They Are an archipelago of three main islands, considered "marine nature reserve": Favignana, Levanzo and Marettimo. The building “gli Allori” is 3 km far from Custonaci and 3-minutes walk from the public transport, that connect to San Vito lo Capo. “Gli Allori” offers a garden and free Wi-Fi all over the property. On Booking.com there are all the customers’ opinion. Who better than a guest could evaluate the free breakfast and judge if the staff is really nice or if the room is really silent? within a month before the arrival date! Breakfast is a special moment for all of us. It gives the first sign on our day and chips in to make that day more pleasant. Sign up for our newsletter to be always informed about our news and offers.